How exactly is energy generated by Fusion? The process in which two or more light nuclei are combined into a single nucleus with the release of tremendous amount of energy is called as nuclear fusion. Like a fission reaction, the sum of masses before the fusion (i.e. of light nuclei) is more than the sum of masses after the fusion (i.e. of bigger nucleus) and this difference appears as the fusion energy. 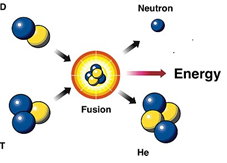 The most typical fusion reaction is the fusion of two deuterium nuclei into helium. For the fusion reaction to occur, the light nuclei are brought closer to each other (with a distance of 10-14 m). This is possible only at very high temperature to counter the repulsive force between nuclei. Due to this reason, the fusion reaction is very difficult to perform. The inner core of sun is at very high temperature, and is suitable for fusion, in fact the source of sun's and other star's energy is the nuclear fusion reaction. The process which occurs at the core of the sun is also the Fusion reaction. The light emitted by the sun and the warmth we feel as a result of it is also the result of fusion reaction. When hydrogen nuclei collide, they fuse into heavier helium atoms and a significant quantity of energy is released in this process. The gravitational forces in the stars of our universe have also created the favorable conditions for fusion. Over billions of years, gravity gathered the hydrogen clouds of the early Universe into massive stellar bodies. In the extreme density and temperature of their cores, fusion occurs. The power generated by the nuclear fusion process is called the Fusion Power. When two light atomic nuclei fuse to form a heavier nucleus, they release a significant amount of energy as a result of binding nuclear force. It is this energy which is called the Fusion Power. Nuclear Fusion requires very high temperatures, in fact on the order of tens of millions of degrees Celsius. An intense interactive force such as gravitation of the magnitude that occurs in the centers of stars is necessary to overcome the electrostatic repulsion among positively charged nuclei. Though it is possible to generate high temperatures and forces required o produce uncontrolled hydrogen fusion, but it is very difficult to sustain these forces for the construction of a nuclear reactor. Fusion power is the power generated by nuclear fusion processes. In fusion reactions, two light atomic nuclei fuse together to form a heavier nucleus. In doing so, they release a large amount of energy, which is manifested as an increase in temperature of the reactants. The basic concept behind any fusion reaction is to bring two light nuclei close enough together so the residual  strong force (nuclear force) in their nuclei will pull them together. They form a single nucleus with a slightly smaller mass, providing energy according to E = mc2. Fusion between the nuclei is opposed by the repulsive positive electrical charge common to all nuclei due to protons in the nucleus. To overcome this electrostatic force, or "Coulomb barrier", the kinetic energy of the atoms must be increased. The easiest way to do this is to heat the atoms. Nuclear fusion produces greater amounts of energy than nuclear fission. Nuclear Fusion occurs on the sun and other stars. Nuclear fusion reactions cannot be contained by anything known or invented as of yet. Produces less radioactive waste than nuclear fission. Possible raw materials are less rare than those for nuclear fission. Thus from the above observation we conclude that, option (d) is correct. It is an accepted fact that the atoms do not rest ever. In fact, the hotter they are, the faster they move. In the core of our Sun, temperatures reach 15,000,000° Celsius. Hydrogen atoms keep on colliding at very great speeds. Once the natural electrostatic repulsion existing between the positive charges of their nuclei is overpowered, the atoms fuse. 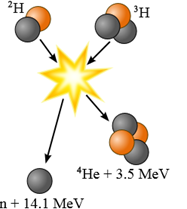 The fusion of two light hydrogen atoms (H-H) produces a heavier element, helium. The result i.e. the helium atom is not an accurate sum of the two initial atoms. Some amount of mass has been lost in the process and a large amount of energy has been produced. This is what is described by the Einstein’s Formula E = mc². The tiny bit of lost mass (m), multiplied by the square of the speed of light (c²), results in a very large figure (E), which is the amount of energy created by a fusion reaction. (a) a less massive nucleus, but not a more massive one. (b) a more massive nucleus, but not a less massive one. (c) a nucleus with smaller atomic number, but not one with a greater atomic number. (d) a nucleus with either greater or smaller atomic number. What is the mass of the products of a nuclear fusion reaction compared to the original elements? Which one of the following would be most likely to undergo thermonuclear fusion? How do fusion and fission differ? (a) Fission release energy by splitting large nuclei; fusion fuses small nuclei. (b) Fusion occurs with light elements; fusion occurs with heavy elements. (c) Fusion requires a great deal of energy; fission releases a great deal of energy. You might like to refer Nuclear Fusion. To get answer to any question related to nuclear fusion click here.